So you know I have embarked on this demented project of training myself to eat the same things for the same meals, varied by the season, and first of all, the obvious breakfast choices are all sweets and starches, and then for a while I was splitting breakfast between yogurt and eggs, but now I want eggs to be my go to breakfast. And summer breakfasts couldn't be easier, boiled eggs and fruit. 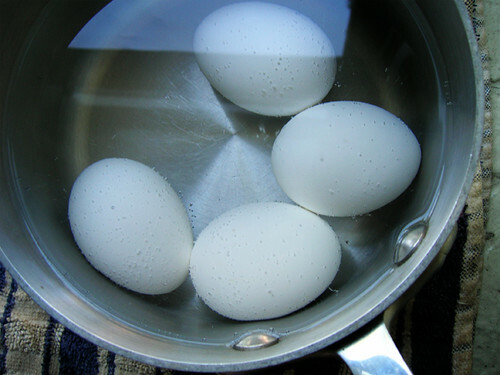 Put the eggs in a saucepan and cover them with cold water. Put the uncovered pan over high heat and bring just up to a boil, when small bubbles start rising to the surface and just before they turn into big bubbles. And you know what they say about a watched pot, I usually do the dishes to occupy myself but close enough to watch the pot out of the corner of my eye. Turn off the heat, cover the pan, and let stand for seven minutes. I set a timer for this. Drain off the hot water and run cold water over the eggs. I peel freshly boiled eggs under cold running water because my dad told me that it shrinks the egg and makes it easier to peel. Then again my dad also told me that consuming large quantities of algae would enable him to cheat death, so. No, seriously. So anyway I boil four eggs at a time, peel two under cold running water and eat them with a side of fruit, and save two to bring to work the next day, with fruit.